In this post, we will learn how Manjula’s Kitchen, an Indian Cooking channel on YouTube with one of the biggest follower base in the category improved their subscriber base from 250K subscribers to 460K subscribers in 20 months by doing one thing right: video design on Typito. Ms. Manjula is a YouTube celebrity who is dedicated to share the richness of Indian vegetarian cuisine through recipe videos of a variety of dishes through her YouTube channel.The channel already today has over 460K subscribers and more than 300 videos that have been very well received by YouTube audience across the globe. While Manjula’s videos were very well perceived among her audience, a major challenge the audience were facing was the ability to grasp and retain the most important details in the videos. Despite cooking being procedural in nature, there are certain fine details that essentially contribute in making of a finger licking recipe. To be able to capture such intricacies in the video with an aesthetic visual appeal was a tricky challenge for Manjula and her team. 5. Call to Action – Request to check out more recipes on manjulaskitchen.com. 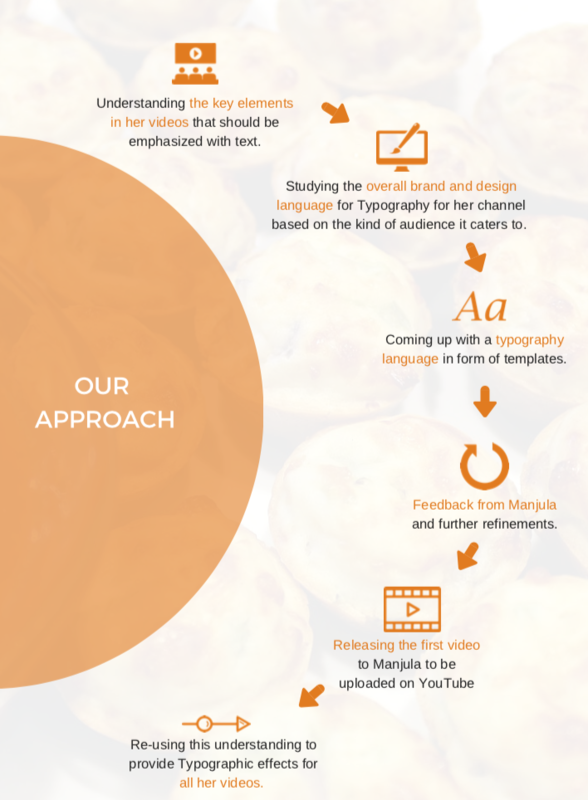 Our next step was to design a motion graphic template language for Manjula’s Kitchen with very specific requirements and here’s what we did in a nutshell. All these templates have been saved on Manjula’s Typito account under ‘Saved’ section so that her team can use them with just a click on all the new videos. Here’s how Saved Templates can be created and re-used on Typito very easily – link. Animated text effects led to a steeper curve in rate of new subscribers for the channel. The rate of subscriptions for the channel has increased to 150% after introducing typography effects. 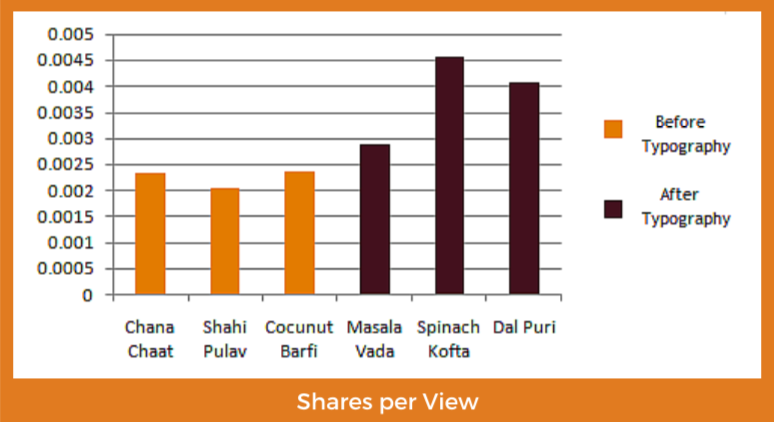 Here is a graph showing Shares per View ratio for 3 videos before Typography and 3 videos after typography on Manjula’s Channel. The graph indicates a spike in share-ability quotient of videos. 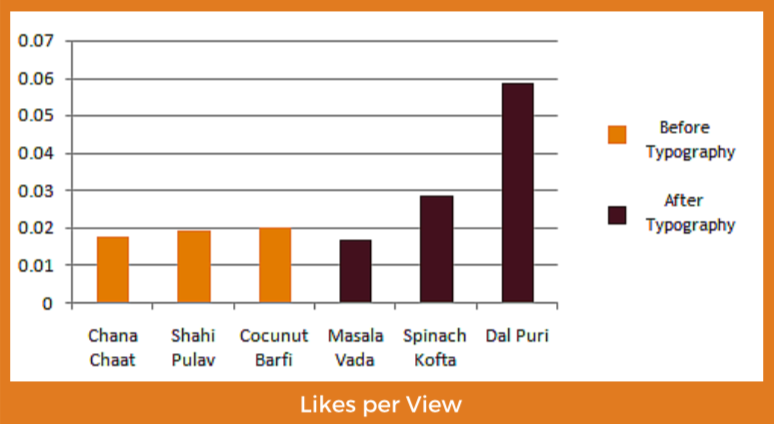 Typography has seen a striking increase in the likes/views ratio for Manjula’s video. Interesting thing to note is that it took a couple of Videos for people to develop a liking for the new format. Carefully crafted Text Templates added a layer of professionalism and smartness on Manjula’s Videos. The positive effect has been validated by her audience as well as Manjula’s team. We believe similar video design exercise on Typito will play a key role in enhancing communication over YouTube videos in coming years. We know how important video is, in the world of short attention span. Let’s get the best out of them by helping them build your brand with consistent template design and articulate your intent better with beautiful text layouts. Reach out at matthew@typito.com with a subject “Video Design Request” if you want us to help you design your videos better, in a way that aligns with your brand. After learning your requirements, we will get back to you with a proposal. Our Design team is committed to improving conversions of YouTube and Facebook videos out there, one YouTube channel or Facebook page at a time :-).